A week long introduction into ski touring starting on and off piste around Hemsedal ski resort, crossing southern Norway’s great mountain watershed and ending by skiing the UNESCO fjords at Flåm, using the world famous Flåm Railway for our daily commute. A truly different and sometimes surreal ski touring adventure. This two base Basecamp trip is for those wishing to make the transition from on-piste skiing into the exhilarating white world beyond the lifts and the groomers under the watchful eye of a certified mountain guide. We’ll start the week in Hemsedal on piste before venturing out into the backcountry that the on-piste skiers can only eye enviously from the chair lift. Hemsedal is Norway’s second largest ski resort, renowned for great skiing, great off-piste and great after ski. The mountains vary from steep alpine profiles to much rounder forms, reaching an elevation of c1800 m. From the summits around Hemsedal you’ll discover a whole new world and see just how small the piste area is compared to the enormous potential of the Norwegian backcountry. After a few days instruction and practice of the basic skills for ski touring we’ll transfer over the mountains to the UNESCO fjord region around Flåm and end the week experiencing every ski tourer’s dream – to ski the Norwegian fjords! The mountains around Flåm are rounder in form though also offer steep skiing and glacier travel. If you are an experienced red or black run skier in good physical form and want to take the next step into ski touring in a safe and secure way and, just for good measure, come home with a brag that will be the envy of evryone then this is most definitely the adventure for you. Departure by train from Oslo Central Station on the Oslo – Bergen railway for the 3-hour journey to Gol. Transfer to Skarsnuten Hotel situated high in the piste overlooking the village and valley of Hemsedal. Today will be spent getting familiar with the ski touring equipment and a chance to find your ski legs. We will ski on-piste as well as accessing some of the lift based off-piste around the resort. Our guide will give you instruction and tips on how to tackle the off-piste and how to adjust your skiing style to the different terrain and conditions. All things important to know before entering the backcountry for real. Today we will hit the backcountry proper. After a good breakfast and a self-made packed lunch from the breakfast buffet the guide will pick you up at the hotel before heading out into the mountains surrounding Hemsedal. The options here are almost endless from steep gullies to slack open flanks. Based on weather & snow conditions and the wishes of the group the guide will find just the right summit for the day’s adventure. Skinning up will be taken at a leisurely pace as the day will also include instruction on the basics of ski touring; skinning technique, route finding, risk evaluation, search and rescue techniques and generally how to move safely and efficiently in the backcountry. Typical of most Norwegians our guides are a relaxed and non-pretentious bunch and naturally create an atmosphere of relaxed learning and comradery. After building confidence and skills from the previous day, we will again head out into the backcountry surrounding Hemsedal, either picking out a summit flanking the mountain pass over to the fjords or in the ranges to the east of the village. Today we will rest the ski legs and move our base to Vatnahalsen in the heart of the UNESCO listed Nærøyfjord area. We’ll transfer by private mini-bus for the 90 minute drive over the mountain pass and in doing so cross the great watershed of southern Norway. From here, the rivers flow either; east ending up at the Oslo Fjord and the southern coast or west into one of the many great fjord arms that penetrate the west coast. En-route we will pass through the world’s longest road tunnel, Lærdals Tunnel at 24.5km. At Aurlandsvangen we’ll get our first glimpse of the UNESCO Aurlandsfjord, an arm of the mighty Sognefjord before continuing onwards to Flåm where we’ll board the Flåm Railway. The 50 minute journey to Vatnahalsen, rising over 800m from sea level is consistently voted one of the world’s most spectacular train journeys and forms part of the much travelled “Norway in a nutshell” tour. After checking in at Vatnahalsen we can take the time to relax and enjoy the epic mountain scenery from the panoramic window with not a road in sight, the train tracks being our only link to civilisation far below or for those up for it we can head straight out into the backcountry for a short ski strip direct from the hotel. After a good breakfast and making our packed lunch, we’ll either start skinning from the hotel steps or take the train a few stops before hitting the backcountry directly from the station platform. Conditions permitting, we may end the day with after ski at the stav church inspired Ægir micro-brewery in Flåm before taking the train up the mountain again. Once back at the hotel we’ll relax by the fire with a drink surrounded on all sides by the amphitheatre of mountain peaks. Today is our last day skiing and again we’ll head out into the backcountry surrounding the hotel. After a great day’s skiing there’ll be time for a quick change before saying goodbye to our guide, checking out and boarding the train again for the journey back to Oslo via Myrdal (867 masl) and through Gol, thus completing our epic loop from east to west and back again. Alternatively, one can travel onwards from Myrdal to Bergen and explore Norway’s second city and former Hanseatic League trading port. 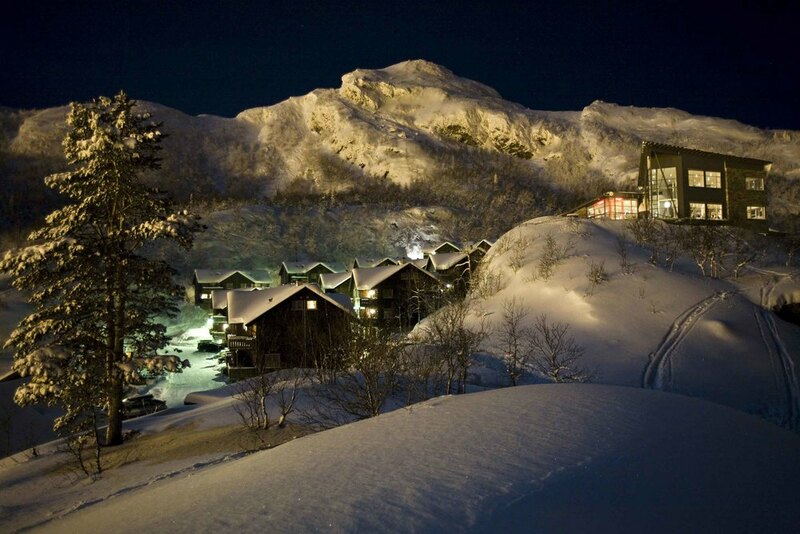 Skarsnuten Hotel, Hemsedal lies perched on a rock promontory overlooking the valley and ski slopes. The cool combination of clean and elegant Scandinavian design has earned it the prize for Norway’s best ski boutique hotel at the Annual Ski Awards 2015. Vatnehalsen Hotel, Myrdal is a small family run mountain hotel accessible only by train, or skis, at an elevation of 820 m with its very own train station on the world famous Flåm Railway. The hotel is surrounded by a natural amphitheater of snow covered peaks providing a remarkable backdrop to a stay here. We recommend you arrive and depart from either Oslo airport or Bergen airport. From Bergen and Oslo you can catch a train to Gol where we will pick you up. From Vatnahalsen you can take the train back to Oslo or Bergen via Myrdal.